This guide will teach you everything you need to know about buying your first home in Brisbane. Ideas from industry insiders that will save you hours of research. And four new case studies that I’ve never shared anywhere else before. ✅ What income do I need to buy a house? ✅ What does it cost to buy a home in Brisbane? ✅ How to buy with no deposit at all? ✅ How do I get a pre-approval? In this chapter, you’ll learn if you’re able to buy your first home in Brisbane. Specifically, I’ll show you how to work out if you have enough savings in deposit to see if you are ready to buy TODAY. (Including lots of real-life examples of these steps in action). You might have spent some time trawling other brokers, or banks website and just want one simple question answered: What can I afford to buy for my first home? Getting an understanding of how much you can afford is one of your very first steps in buying a home. Show me the money, and tell me what I can afford to buy for my first home? Knowing what you can afford, or your borrowing capacity will help you determine your broad budget in what you can afford. But when looking at buying your first home, borrowing capacity or income isn’t the only important element – you need 2 things: Income and a Deposit. Buying a Home needs 2 main ingredients – Income (what the banks sometimes call serviceability or borrowing power) plus Deposit (sometimes called savings). Let’s start with the Income side of the equation. What Income Do I need to buy a home? A home loan is something you are committing to for years, if not decades with the average loan term being 20 to 25 years! To be able to assess your ability to make payments in the future, the banks will look to see if your income has been stable and constant over the past one to two years and if its likely to continue. To work this out the banks will typically want to see some documentation with your income history, like group certificates and payslips. Banks will sometimes ask for your PAYG Summary, or Group Certificate to confirm your annual salary. If your income is variable, like being self-employed or paid a commission you may need to submit some extra documentation and be prepared for the banks to be slightly conservative in their income calculations. Also, keep in mind that not all income is considered equal. For example, banks will typically only count 75-80% of rental income, as it is seen as being riskier than employment income. If you are a self-employed first home buyer in Brisbane the bank will ask for your tax return, like this. Our mortgage brokers will give you a rough idea on what you can afford and what your repayments will be, but as a rough idea, the banks will lend you around 5-6 times your gross annual salary. West End is a popular suburb in Brisbane for First Home Buyers. In this basic example, if your income is say $50,000 and you are single without any credit cards your mortgage broker can arrange a loan of around $320,000 – however if you are a couple and your combined income is $50,000 you will only be able to borrow around $173,000 because you both need to share your cost of living between you. Calculated with inputs: Uncommitted monthly as above, Assessment rate 7.00%, 360 month term, basic living expenses as per Connective Compliance Calculator as at 16th August 2018. Does having a credit card affect how much the bank will lend me? If you are currently earning $50,000 and have no other credit cards or personal loans, the banks will give you a loan of around $320,000 to buy your first home. BUT as you can see from this person, they have a $6,000 credit card limit – which has not been used. A $6,000 credit card can reduce your borrowing amount by $30,000. This can drastically reduce your borrowing capacity, as you can see below the addition of a credit card reduces the amount that can be borrowed from around $320,000 to as low as $254,000!!! In this example, a $6,000 credit card reduces borrowing capacity by $30,000 to as low as $254,000! This isn’t just limited to credit cards. If you have personal loans, HELP/HECS debt, ZipPay or Car Loans your borrowing capacity can be really affected – but don’t stress, you can sort all this stuff out now and start cleaning it up so you are going to be ready to buy! Is borrowing capacity the same as purchasing amount? Borrowing capacity is how much the bank will lend you, remember at the beginning I mentioned purchasing amount = borrowing + deposit. In the example above, if the bank loans you $320,000 and you have $100,000 in savings you could look to purchase a home valued between $400,000 to $420,000 – but in reality, it can get a bit more complicated than this. Because when it comes to getting a home loan, it’s helpful to think like a lender. Each bank has a unique home loan policy, and ways they assess risk so it’s important having lots of different banks to choose from to find the right one that will work with you. Remember these guys are pretty risk-averse, and ultimately when a bank is deciding whether or not they want to give you their money all they really care about is: can you pay now, can you pay later and do you have proof? Tip: If you are thinking about switching jobs in the future, the bank will ask about gaps in your employment history or a reduction in income over the past few years. And if you’re currently in the loan application process, it is best not to change jobs if you can avoid it as it could impact your ability to get financing even after you’ve been approved. The banks look at things like your employment history, consistency of your income, other debts you might have and savings to assess if they will lend you the money or not. LVR is Loan to Value Ratio. It is the percentage of money you borrow for a home loan compared to the value of a property and calculated as the loan amount divided by the home value. The banks use LVR to determine if they will approve your home loan. In the below example an $80,000 loan for a $100,000 property purchase would mean an 80% LVR. As the LVR is 80% and below it would not have LMI or Lenders Mortgage Insurance payable. Read More: What is LVR, how to calculate? LMI is Lenders Mortgage Insurance, it is a one-off fee payable by you the borrower to cover the bank – its insurance that covers the bank. In some circumstances we can arrange to have the LMI waived if you work in a certain profession, speak to our mortgage brokers to see if you qualify. How much deposit do I need to buy my first place? The more you can pay upfront (given you have some emergency savings kept aside) the less you’ll need to borrow, and the lower your repayments will be. We will go into the full amount for deposit shortly, this will include stamp duty but if we just look at the bank deposit required: for a $300,000 purchase, a 5% deposit is $15,000 or a 20% deposit is $60,000. If a 20% deposit seems unreachable, keep in mind that for people with great credit and steady income a 5% deposit loan can help get your foot into the door. Remember that in addition to your depot amount, you’ll need to make sure you have enough to cover settlement costs and other fees, like mortgage registration and bank fees. Tip: Keep in mind settlement costs like stamp duty can add thousands of dollars to your total upfront costs and are typically around 0.5-1% for first home buyers in Brisbane or 2-5% for regular home buyers. If you are thinking about getting some help from your parents or a family member with your deposit, or a guarantor loan now might be a good time to start having a conversation with them about this. It will give you a realistic picture of what you will be working with, and get them prepared around your timeframes. If they are going to gift you funds, it will need a letter and documentation from the donor so getting the funds transferred sooner rather than later can save the paper trail and headache later in the piece. In Chapter 2 we look at ways of buying with No Deposit. How flexible are your home buying timeframes? Realistically you are the only person that can assess if you are ready to buy a home, the more flexibility you have in your timeframe. This will give you more time to improve your credit score, reduce your debt and increase your deposit – not to mention the search for your dream home! Want a second pair of eyes? Schedule a Home Buying Readiness Assessment Call with one of our Mortgage Brokers. Learn how to increase how much the banks will lend you and how you can buy with no deposit at all. Buying your first home isn’t easy. You are spending hundreds of thousands of dollars, and not only do you need to find the right place you need to be able to make sure the numbers work, the bank will lend you the money and you will also be able to afford it today and into the future. The chapter contains a library of resources that will help you get the best financing options, including advanced strategies to INCREASE YOUR BORROWING POWER, and ways to allow you to buy with NO DEPOSIT. Buying a Home in Brisbane without a deposit is possible. Does the bank affect how much can I borrow? We covered what borrowing power was in chapter 1, but does the bank affect how much you can borrow? In short yes it does. A longer answer is, how much you can borrow really comes down to a few different factors. There is a large difference in maximum loan amount between different lenders. You can calculate your by speaking with our mortgage brokers to give you an estimate of what you can afford because it will help you with your research and so you can start shopping around for what’s within your budget. As we covered in the previous chapter, the banks are lending between 5 to 6 times your gross annual income (i.e. your income before tax and not including superannuation) but there is a bit more to it than that. Calculated with inputs: Uncommitted monthly as above, Assessment rate 7.00%, 360-month term, basic living expenses as per Connective Compliance Calculator as at 16th August 2018. When you speak with a mortgage broker they will assess a number of factors including your income (full time, part time, self-employed) marital status, any dependents you may have, your credit score and general living expenses. Any existing debts will also be taken into account. A couple will have a different borrowing capacity to a single income and your current living expenses will also be factored in. As you can see from the example below, the borrowing capacity of a single person compared to a couple with 2 children is very different and just looking at Westpac Bank for example, the lending capacity goes from $633,000 to $285,000 because the cost of living for 4 people is much higher than 1 person. The borrowing power is much lower than compared to the scenario above. A bank might be able to lend you a large amount but should you borrow it all? This is the reality, it’s not always about what you can borrow but what you should borrow. But remember there are a number of added costs when it comes to buying a house such as council and water rates, stamp duty, maintenance, and repairs, and don’t forget the risk of interest rates rising. How do I increase my borrowing amount? Improving your credit rating. If you have a good credit score and very few recent credit inquiries banks are going to be more willing to lend you money than if you have unpaid defaults or had issues in the past. Removing Defaults. If you do have defaults, make sure you have paid them and even try contacting the company to see if they can remove the default once it has been repaid. Otherwise just make sure you get into the habit of paying off your credit cards on time. Ditching your credit cards. Look at your spending patterns along with the credit limit available and try to at a minimum reduce the limit, or close. A credit card limit of $10,000 can reduce your borrowing capacity by up to $50,000. And lastly, there is getting a pay rise. While this might not be possible in all instances, a pay rise as small as $5,000 could be all you need to get that dream home. Credit cards can impact your borrowing capacity. It is still possible to purchase a property with as little as 5% bank deposit, but you will need another 2-3% for stamp duty and costs –meaning the total amount you need is going to be closer to 8% of the purchase price. Practically this means on a $300,000 property you would need an 8% deposit or $24,000 to purchase it.- but with the $15,000 first home owners grant this could be closer than you think. In reality, and assuming you are a first home buyer in Brisbane you may have some stamp duty relief but there are additional costs that you will need to pay to settle the property including solicitor fees, transfer duty, and moving costs. So let’s stick with the $300,000 property purchase example. You will need to cover costs government fees, title transfer fee, transfer of land fee, legal costs, lenders mortgage insurance and other bank costs – in addition to your 5% deposit. In this scenario, you will need to contribute around $25,232 – so the total deposit you need is closer to 9% of the purchase price. This isn’t including other costs of moving that you will need to pay like removalist costs, building inspection or connecting your new phone so it’s always worth having some extra money available. Funds position for a first home buyer – You will need to contribute $25,232 – If you are eligible for the $15,000 first home buyers grant, you would only need to contribute $10,232. How much you would need to contribute to a $300,000 without the grant. When you buy your first home you do not have to pay stamp duty, but this is not the case if you have already owned property in Australia before. For this reason, if this is not your first home purchase you will need to find an additional $3,000 that will go towards the stamp duty. Can I buy with a 10% deposit? Many lenders prefer a higher deposit because it is considered lower risk, and sometimes even give bigger discounts when you have more deposit to put down. A 10% deposit would mean that if you’re looking to buy a house valued at $300,000, you’ll need to find another $15,000 to put towards your purchase. The benefit of this is your lender’s mortgage insurance costs will go down from $7,688 to $4,303 but your total contribution will increase to $39,847. What is the criteria for No Deposit home loans? When you apply for no deposit home loan, lenders apply very strict criteria including having good credit, with a well-maintained repayment history, stable income sources such as a regular job and consistent payments as well as a common property type – banks don’t like strange properties like caravans or removable houses. Buying a home with no deposit. If you have a strong income, and not a lot of savings it might be possible for you to buy without any deposit at all. The main situation where you can purchase a property without a deposit is when you have a guarantor that will co-sign the loan agreement. This means your parents or direct relatives (like brothers, sisters, grandparents) need to own an existing home or investment property that your bank can put a second mortgage against to help with your purchase. In effect this allows you to borrow up to 100% of the new purchase price, but we’ll come back to this in a minute. 1. GUARANTOR LOANS: Borrow up to 105% of purchase price. The idea is for you to get into the property market sooner. Once you have paid off part of your loan or your property has increased in value you can remove the guarantee. 2. FIRST HOME BUYERS GRANT: $15,000 from the government. Some states in Australia are giving up to $15,000 towards first home buyers to purchase their first homes – Best of all, this grant can be used towards your deposit! So for example, on a $300,000 property you need to provide 5% deposit, or $15,000 – so the First Home Buyers Grant can help you get into the property market without any deposit at all. There are some caveats on this like needing to qualify for the first home buyers grant in Brisbane, and at the moment these are limited to being available only on new properties so you’ll need to see if it is suitable in your situation. 3. PERSONAL LOAN: Borrow up to 95% of the purchase price. Generally, you will need to have a smaller deposit like 3% to 5% and a very high income to make a personal loan as deposit work. Using a personal loan you can borrow up to 95% of the purchase price plus a personal loan, but you need a clear credit history and cannot have more than $10,000 in existing debt. This option isn’t suitable for all people, and we recommend that you speak with your parents about a guarantor loan before you consider this option. 4. GIFTED FUNDS: Borrow up to 80% plus your gift. Around 50-60% of first home buyers receive help from their parents, gifted funds work if your parents can give you 5% to 15% of the purchase price. And while this isn’t available for everyone might help you get your foot into the door. 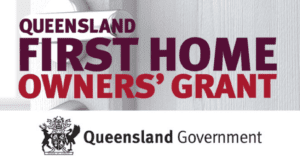 In Queensland, you may be eligible for the First Home Owners Grant which is currently $15,000 that the government will give you towards your first home purchase. To be eligible you need to be a first home owner, and you need to either buy or build a brand new home that is below $750,000. The good news is you can use this $15,000 towards your deposit! For example, if you want to buy a house, you ask your parents for help. They might not have enough cash to offer, but you can use their house as security. This method was not allowed in the past, but now a number of lenders have introduced policies that allow a person to use another property as a security. They allow your immediate family members to offer their house as a co-security. In other words, the financial institution will accept that property as a substitute of a cash deposit. Using a property as co-security has its pros and cons. The advantage of using this policy is that there is no need for mortgage insurance, which saves a lot of money. On the other hand, the drawback of signing up for this policy is that your immediate family members get stuck with you. They are eventually released from this obligation once you pay down the loan amount or if the value of property increases. Schedule of payments, showing loan repaid over 30 years. This option will allow you to buy a home with no deposit if you are buying a home for the first time and entitled to get a first home owner grant. It will also enable you to cover your cost, such as legal expenses or transfer cost, etc. Learn the steps it takes to get a home loan, and some of the common mistakes first home buyers in Brisbane make. Buying a property successfully starts before you sign your first contract of sale. Knowing the costs before putting down a contract, the process of getting your home loan approved and working out your budget all plays a key role in your property buying success. This page contains a library of resources to help you successfully get the perfect home loan. Mortgage Broker or Bank for my home loan? Before we get into it, why speak to a mortgage broker? They help do the paperwork for you, negotiate a better deal with lenders (and provide annual reviews) and it doesn’t cost you anything as mortgage brokers are paid by the banks. How do you help first home owners, do you have any recent examples? Make sure your broker is a member of the FBAA. The first step in the home loan application process is the eligibility assessment. The mortgage broker will set up a meeting and assess your current financial situation to find out if you meet the eligibility criteria. They will also discuss your objectives and requirements so as to find out the best solution for you. Contract Employment (full time or part-time) – The borrower must be working for at least a year with a current employer, or have a minimum of 2-year continuous experience in the same industry. If a person is on a probation period, the strength of their loan application and financial position matters a lot. Casual Income – He or she must have at least 1 year of experience in the current employment to be able to qualify for a loan. If a casual employment is their only source of income, the application assessment is done on a merit basis, keeping in mind the borrower’s financial position. Self-employed – In this case, a person must be doing the same business for at least 2 financial years. The lenders may also consider the application if a borrower only has 1 year of experience in their current business, but have at least 2 years of experience in previous employment within the similar. However, the overall strength of the application will be taken into consideration for that matter. Second Job – A person must have at least 1 year of experience in their current job. If the duration of employment is met, 100 percent of the borrower’s income will be accepted for review by the lender. Below are the income types that might be fully accepted – subject to certain conditions. When a mortgage broker completes the preliminary assessment, a number of loan products and lenders will be recommended by them. What to Do Once Application is Submitted for a Pre-approval? Can you make a bid at the auction? Are you required to satisfy conditions before going to the auction or making an offer? What are the preapproval conditions? Has your application been approved by the lender’s mortgage insurer? Has your application been accepted by the credit department? Different banks have different policies on pre-approvals. Some are valid for 3 months, some are valid for up to 6 months. You are required to submit a formal approval, signed by a lender for it to be reliable. This will make it easier for a lender to assess your application. The more conditions you fulfil, the more your chances are to get a pre-approval. Banks or lenders don’t have to check-off too many conditions on the application. If there are things on the application that are yet to be confirmed, ask the bank to confirm it first and then submit your application for approval. The pre-approval submitted is for more than what you plan to spend on the property. This way you won’t have to apply for another pre-approval if the budget is revised. Once you fulfil all the conditions, the bank will give you unconditional or final approval. This is the final step in securing a loan. It shows that you are guaranteed to receive a loan and your application has been fully approved. Unconditional approval is only reversed if a lender suspects any fraudulent activity or find any discrepancy that was missed earlier. If a private vendor accepts your offer or you win in an auction, you’ll get a grace period of 1 to 3 weeks to get your initial deposit and finances in order. During that period, you can check back with your lender to make sure they will honour the contract. Even if you don’t get a grace period, make an inquiry and ask your lender if they will give you approval. A formally approved loan is not subject to any further approval conditions. A complete guide to finding the right property in Brisbane. Are you looking for a property, but aren’t sure how to pick a growing suburb? If so, don’t worry! You aren’t the only one confused. There are so many Australians who struggle to pick a growing suburb right for them. Buying a house is a big financial decision, which is why you want to give careful consideration before making a final decision. To make it easier for you, here are a few tips that will help you pick a growing suburb. Finding a home in Brisbane is easy. Making sure it’s the right one? That’s another story. Fortunately, there are a handful of proven approaches, strategies and tactics that you can use to find, and filter the perfect property in record time. And in this section, you’re going to learn about those strategies (and how to use them). This page contains a library of resources to help you find the right home, filter it to meet your criteria and work out if the price is right. There are lots of factors that drive property growth. What does Property Research involve in Brisbane? Property Research involved you digging a bit deeper than a quick search on RealEstate.com.au or Domain – it involves putting you ahead of your competition and securing the best deal for your first home purchase. The first thing to do is analyse the sales data. Many companies post their reports online that can be either purchased or you can access them for free. From here, you can see the price growth of different suburbs in these reports. They show growth over a period of 10 years, 1 year, and also include information about the monthly growth in the property price. Spend some time analysing this data as it will help you pick a growing suburb through identification of different market dynamics. It will also enable you to find suburbs that are about to experience a surge in prices. You can also find information on local newspapers. In fact, the Australian Bureau of Statistics also posts analytical articles that contain market information about dwellings and demographics in a summarized form. You can use that information and compare it with national and state data. Why is Property Research important? Doing this level of research helps you make well-informed decisions. In property, knowledge is power and the more you understand about the local property market, recent sales and the history of the home you are looking at buying the better you will be at negotiating with the real estate agent – potentially saving you tens of thousands. The property market has shown strong growth in recent years. It might feel daunting when starting off to know where to even start looking, but once you have followed the steps in the previous chapters you will know your rough budget. You can use this as your criteria to start filtering the good from the bad and getting a feel for the local market. 2. Compare Prices of Different Properties – Print out all of the property prices you plan to visit and compare them, as it will help you assess their condition, keeping the price factor in mind. Recent House Sales are good indicators of the properties valuation. 3. Attend Auctions and House Inspections– Even if you don’t intend to buy a property yet, visit as many inspections and auctions as you can. It will help you find out how many people are actually willing to buy a property and what price are they willing to pay it. 4. Be Flexible– Finding the right property is not easy. This is why it is important to keep your options open. Don’t restrict your research to the area where you intend to buy a property. Search the surrounding areas as well. In most cases, you can find a really good house in neighbouring suburbs at a very reasonable price. Remember, it’s going to a be a long-term game, so give yourself time. It can be quite a stressful task as you might have to visit a number of houses every day. Which area is affordable and suitable for you? How many rooms do you need or want? Do you want to buy a house for investment or residential purpose? The list of questions is never-ending, especially when it comes to spending a lot of money, but these are some of the basic questions you can ask yourself before finding a property. I like using WalkScore (https://www.walkscore.com/) to see what is in the local area and what the transportation is like. WalkScore gives you a good idea of the amenities nearby. How do you value properties in Brisbane? When you try to find the accurate numbers, there can be a lot of conflicting information available in the market. The media may give you a completely different set of figures, whereas, real estate agents might tell you a different story behind each estimate. 1. What do you compare the property with? The number of rooms – The properties should contain the same number of car parking areas, bathrooms, and rooms. Size of Land – The size of the lands on which the properties are built should be the same as the size of your land. Location – They are located at almost the same distance from facilities and amenities and the residential area has the same look and feel. An example that we’ll work through, 22 Bayview Tce Wavell Heights QLD. Once you find at least 3 or 4 properties that are similar to your property, the next step is to figure out which one is inferior and which one is superior. However, try to be objective in your decision. As discussed, there are a number of factors you should keep in mind, such as views, parking, living area, land size, location, and standard of finishes when ranking the properties. It’s important to observe the market as it helps you understand its dynamics. For example, if you are in a hot market, 3-month-old information will not be valid for comparison, and won’t give you accurate figures; you’ll have to make small adjustments to get to the right value. Attend auctions to understand how property prices are determined, because if you are serious about buying a home, then you’ll be ready to bid at auctions. Prior to this, you will have to pay for a building and pest inspection that might cost somewhere between $250 and $400. In some cases, sellers or their agents pay for such inspections and buyers are only required to pay for the report, which is relatively lower than the inspection cost. Being led under the Wrong Influence of Agents – Don’t get influenced by the real estate agents. Their main purpose is to sell the property and they will try their best to do so by only sharing a part of the whole truth. Gather information from various sources and don’t just rely on the agent. Doing the Wrong Comparison – People normally don’t consider the size, location, quality of property when comparing properties, which makes it difficult to value a property accurately. As discussed, make correct comparisons by keeping all the factors in mind. Making Emotional Decisions – This is a big NO! Don’t get emotionally attached to the property you want to purchase as you might end up paying a price much higher than the market value. Don’t Listen to the Media – The information provided by the media is not reliable. Its main focus is to sell the news. Instead of seeking information through media channels, visit platforms, such as CoreLogic or Residex as they provide real-time information based on actual statistics and facts. When you plan to invest in a unit or a property, always keep the impact of developments in the surrounding area in mind. For instance, look at the construction of high-rise buildings or the development of new housing estates in the area. The higher the number of available-for-sale properties, the lower the return on investment will be. In other words, the return will be diluted due to the increasing number of properties in a suburb. Therefore, keep the demand and supply factor in mind if you wish to pick a growing suburb. The key to finding a growing suburb is to think out of the box. Don’t confine yourself to the area where you grew up in your childhood. Many people stick to the area where they were raised, which makes it harder for them to buy a property at a reasonable price. If you want to pick a growing suburb, it is important for you to go out of your comfort zone and explore new suburbs. Many investment opportunities are available in the property market, including commercial, rural, or off-the-plan properties. Therefore, keep your options open and visit new areas once a week to get a better idea about the prices in different suburbs. Another indication to pick a growing suburb is the infrastructure development in the surrounding area of the suburb. If there are shopping centers, hospitals, schools, and other amenities available in a suburb, it has the potential for investment growth. These facilities increase the chances of rentability and also, attract people who want to experience a lifestyle change. Therefore, one of the best ways to pick a growing suburb is to look for a planned infrastructure in the area. If its local council plans to build a school or a shopping mall in the future, it is quite likely that the property prices in that area will also increase. This information can be found on the website of government transport companies and local councils. By keeping these tips in mind, you can find an investment opportunity that offers attractive returns in the future. Did you know that if a lender isn’t satisfied with the property condition, they may not approve your loan? This is why it is important not to buy a property before you apply for your loan. Some lenders don’t approve a property if land area is more than 2 hectares, but it varies from one bank to another. There are some lenders who also accept a property as a security even if the area is 50 hectares or higher. Some banks reduce the loan to value ratio if the property is located in the remote area. Banks may value the property way less than its purchase price if the seller has included furniture in the purchase price, and offers a settlement rebate and rental guarantee. In Brisbane, we have had issues with flooding over the years, with major flooding in 1974, then again in 2010 and 2011. Because of this I always check Brisbane homes for flooding using the website Floodwise. It only takes a few seconds and you can get a detailed report to see if your new home is at risk, ranging from a high likelihood (5% annual chance) to a very low likelihood (0.05% annual chance). This will also affect your insurance premiums so it’s worth knowing before you sign any contracts! Brisbane Flood Awareness map lets you know about the chance of flooding. A complete guide to dealing with Real Estate agents, and getting an offer accepted on your first home. Shopping around for a property can be both fun an exhausting. So at some point, you are going to want to put an offer on your future home. Most people think they need to go and fill out a contract of sale in the real estate agents office, but I’ll show you this isn’t needed and a few other ways to position your offer above others. This chapter contains a library of resources to help you land your dream home. Let’s help you secure the perfect first home. Remember a good real estate agent will work hard for the seller to get the best price so they aren’t working for you as the buyer, and most agents are paid commission to sell the property – and as harsh as it might sound they won’t waste time on buyers who are unsure or unwilling to commit. You need to put your best foot forward, and by asking the right questions you can quickly identify potential issues on the property, get a better idea on the value of the property and the seller’s motivations and make an offer that will put you way ahead of your competition. How to make an offer on your first home? Do you know if you’re making the right offer to buy? It can be hard trying to find the perfect property to get the most value out of what you are paying for because you don’t want to end up paying more than the market value. Making an offer can lead first time buyers to confusion and stress. But the good news is, you are not alone. For example, a seller who has bought another property might be keen to sell their old property quicker and are less sensitive on the sale price. You could offer a lower price but with fewer days for due diligence or finance, to put your offer ahead of others. The amount of time a property has been for sale on the market will ultimately influence its price. When a house is initially listed for sale it becomes an interesting property for both real estate agents and prospective buyers for the first 14-21 days. If the house hasn’t been able to find a buyer after 60 days, it becomes stale and is generally much harder to sell because there is limited interest, there could be issues with the property or the price being asked is too high. For this reason, it’s important to take your time to find out why the property has been on the market for so long – maybe other buyers have struggled with finance? Have there been problems with valuations? On the other hand, some others are happy to wait years for an unrealistic price, while other sellers could be desperate to sell and may accept a low offer. Another thing to look out for is if the real estate agents contract to sell the property is about to expire (usually 90 days) then the agent will get onto your side to get the seller to accept a lower offer. What was the original asking price? It is worth asking the real estate agent what the original price range was on offer and getting a bit of a history on the sales campaign so far. You can ask them how many offers are made, and the prices being offered. If they were declined by the seller, or if they were accepted why the deals fell through? You might find a home you really want to purchase, that’s great! Don’t feel bad asking the real estate agent if the seller is ready to reduce the price – they could give you some valuable information even before you make a deal. As a general rule of thumb, and depending on the location Australian properties sell up to 10% less than their original asking price. This is known as vendor discounting, you can see what the average discount in your suburb is on RP Data. What’s the lowest price they are willing to accept? Another worthwhile question is to ask what the lowest amount the sellers will accept. In some cases, the real estate agent will just tell you – in others, they might give you a bit of a hint. The real reason in asking the question is to get a better understanding of the minimum price, if the real estate agent quotes $500,000 then you can understand whether you can really afford the property. Are you Using the Right Negotiation Strategy? Last but not the least, devise and follow the right negotiation strategy. Instead of making the offer first, let the seller come up with the price. This will give you a clear idea of what the seller is expecting and how much you can negotiate. For example, if you make an offer to purchase the house at $600,000 when the advertised price of a house is $650,000 and the seller was willing to sell it for $550,000, you will end up losing $50,000 that could have been saved had you not initiated the offer. With this particular property, they were asking for offers over $750,000. I started with an offer of $690,000 and settled with the vendors at $705,000 – I actually beat another offer the vendors had at $710,000 because I had shorter finance and settlement terms. Chapter 6. Signing the contract & what happens next? A complete guide to signing the contract for your first home. What does Contract of Sale Contain? Okay, so we already know that buying a house is a huge decision. Not only does it involve a heavy investment, but also comes with the stress of finding the right property, attending the building or pest inspection, and more. However, sometimes lenders want their borrowers to get building insurance before proceeding with the settlement. In fact, they want it to be included in the policy. When you plan to buy a house, it is important to protect your property against any possible risks. Building insurance usually gives you coverage against any damage that may occur due to rainwater, fire, and most natural disasters. It covers the items, such as air conditioners, switches, cables, pipes, light fittings, hot water system, and more. In many cases, gates and fences are also covered in the insurance contract. It also provides coverage of valuable items like washing machines, furniture, and computers. The company uses a cost per square meter method, which gives a rough estimate of the material used and the size of a building. If you are a first-time home buyer in Brisbane, it’s important to be aware of the different stages of a home loan approval before you reach the settlement stage. Although it can be confusing at first, getting complete information about it is important as it will help you gain a better understanding of the home loan process. There are three different stages of a home loan approval, including a pre-approval, a conditional approval, and an unconditional or formal home loan approval. Getting a formal home loan approval means the lender is satisfied with your financial situation and is willing to give you a loan for the property you wish to purchase. A letter will be issued to you confirming the approval from the bank! Congrats! A complete guide to settling into your new home. We look at what happens after your loan is approved, the steps you need to take before settlement and one small thing people always forget to take care of! Once the numbers are finalised there could be a shortfall between your original deposit amount and the final contribution that is needed at settlement. This may take into account taxes, and duties as well as adjustments paid by the seller. Just keep some funds handy in case you need to pay this on settlement day. Arrange home & contents insurance if you haven’t already, including insurance to cover accidences and damage, including theft and water damage. Settlement & getting your keys! Settlement should occur as per the settlement date in the sale contract. Your solicitor and lender will attend settlement on your behalf, where all costs will be disbursed. The property will be transferred into your name and the lender takes possession of the title (this is their security in case you default). Once this process is complete, you now own your brand new property! As an added bonus, we have detailed the first home buying process in as much detail as possible. You can use this as a checklist to help you go from finding to settling your new home. If you need a hand with getting finance or have questions on the home buying process speak with our team and schedule a Home Buying Readiness Assessment Call with one of our Mortgage Brokers.